The Synergy™ .5 Spiral is the affordable solution to stretch wrap your loads without stretching your budget. 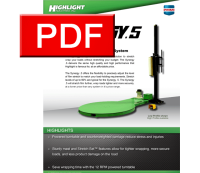 The Synergy™ .5 delivers the same high quality and high performance that Highlight is famous for, at an affordable price. The Synergy™ .5 offers the flexibility to precisely adjust the level of film stretch to match your load-holding requirements. Stretch levels of up to 60% aretypical for the Synergy™ .5. The Synergy™ .5 will stretch film further, wrap loads tighter and more securely, at a lower price than any system in its price range. The Synergy™ .5 is a durable system at an affordable price. The Synergy™ The Synergy 2 with Dual Hydro-Stretch™ delivers more load holding strength than any other stretch wrap system available! The Allen-Bradley PLC with three unique wrapping patterns ensures reliability and flexibility. The fast 12 RPM turntable wraps your loads quickly. 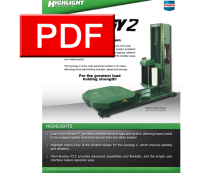 The Synergy 2 is the most advanced system in it’s class, delivering more load-holding strength, speed and savings. The Synergy™ 2.5 is the most reliable fixed gear powered pre-stretch system in the industry! 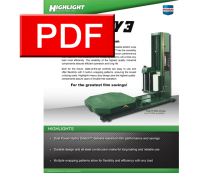 The simple and reliable powered pre-stretch provides greater film savings and performance, and the semi-automatic controls allow for excellent prductivity and consistent wrapping. 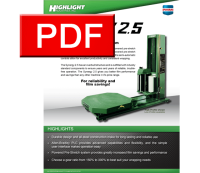 The Synergy™ 2.5 has an overbuilt structure and is outfitted with industry standard components to ensure years and years of reliable, trouble-free operation. The Synergy 2.5 gives you better film performance and savings than any other machine in it’s price range. The Synergy™ 3 is the most versatile, flexible, and reliable stretch wrap system in the industry! Dual Power Hydro-Stretch™ has the versatility to adapt to any stretch film and deliver the maximum performance from that film. The flexibility of five wrapping patterns will unitize any load most efficiently. The reliability of the highest quality industrial components assures efficient operation and long life. Built for the future, state-of-the-art controls are easy to use and offer flexibility with 5 built-in wrapping patterns, ensuring the lowest unitizing costs. 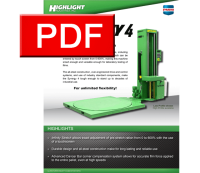 Highlight’s heavy duty design plus the highest quality components assure years of trouble-free operation. enough for laboratory testing of films. control systems, and use of industry standard components, make the Synergy 4 tough enough to stand up to decades of industrial use. 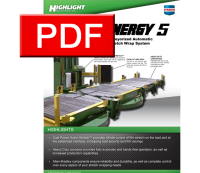 Highlight Industry’s Synergy™ 5 Automatic is the industry standard for conveyorized turntable stretch wrap systems! Infinitely adjustable Dual Power Hydro-Stretch® allows ultimate stretch film control with maximum load security. State-of-the-art touch screen controls provide reliable operation and versatility through ten user-programmable wrap "recipes", as well as diagnostic indicators for troubleshooting.